VA Home > Blog > Honor Role: 10 Push Ups for Final Salute Inc.
You may remember a previous piece that we did on Miss Veteran America (MVA) and Mr. Mom of 2014. Kimberly Wolfanger and her husband Michael have become big veteran figures as spokespeople for Final Salute Inc., who takes on the noble cause of helping end female veteran homelessness. Since we at VA Home Loan Centers are big fans of Final Salute Inc., we often hop on social media to talk about what they are up to. Their biggest method of raising funds and awareness is through their annual MVA competition. MVA, which models itself to be like the long-standing Miss America tradition, has two big differences which makes it unique. First, the competitors all have to be female military members, and secondly, they do not call MVA a pageant. One day, we made a bit of a mistake. We called MVA a pageant on Twitter. From this accident, however, came a fun and inspiring movement to help bring awareness to the cause. When the blunder took place, we were told that we needed to drop and give ten push-ups, via the orders of MVA Emeritus Denyse S. Gordon. We complied and then some – we posted the ten push-ups evidence on YouTube. From this, Final Salute Inc. and VA Home Loan Centers challenged others to take part in the 10 push-ups challenge and mention in corresponding videos to talk briefly about the cause. 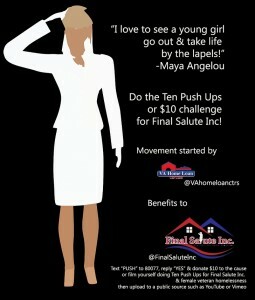 Final Salute Inc. went a step ahead and suggested that those challenged either do the push-ups or donate $10. Flula Borg of “Pitch Perfect 2” took the challenge, which you can watch here. Shawn Goodwin of Syfy’s “Destination Truth” took the challenge in this video. Kerri, one of the finalists for MVA 2015, did this great video for the 10 push-ups challenge. Rachel also did the 10 push-ups challenge in this video and got Ballston Crossfit to take the challenge here. Lisa took the challenge here, and she got a colleague to take the challenge here. Another finalist Heather showed how easy it is to donate via phone and took the challenge in this video. Because team work makes the dream work, another finalist Charmaine got a whole group of veterans to do 10 push-ups for the cause, which you can watch here. Donate $10 by texting the word PUSH to 80077. Your cell phone bill will accumulate the $10 and it will be part of your next mobile bill. 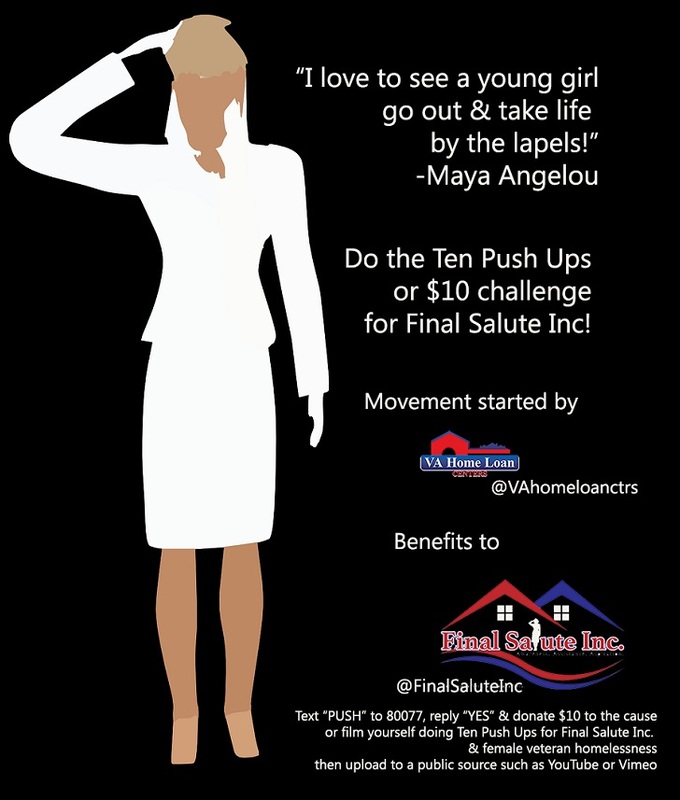 Take a video of yourself saying you are doing 10 push-ups for female veteran homeless awareness in partnership with Final Salute Inc. or mention Miss Veteran America 2015. Post this video in a public forum on YouTube or Vimeo and spread it on your social media channels. Donate AND do a 10 push-ups video mentioning MVA! Visit Finale Salute Inc.’s website or follow them on Twitter at @FinalSaluteInc. If you are seeking information on the VA home loan program, tweet us on Twitter at @VAHomeLoanCtrs or call 888-573-4496.